In mid July I was in Chicago for a wedding. We had a decent view of Navy Pier from our room. I noticed the endless line of boats out on the lake and tried to wait for the right moment. A couple of times I lucked out, and from my position the boat ended up in one of the spokes of the ferris wheel. 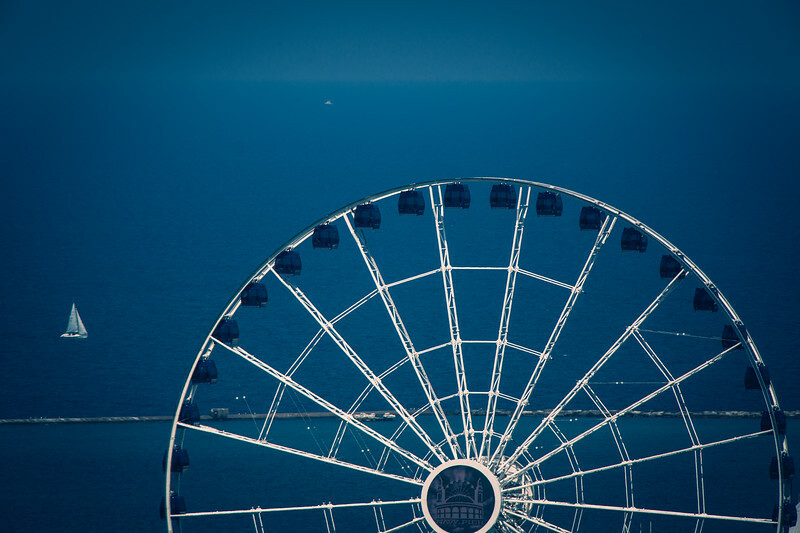 I liked those photos, but this one with the sailboat just outside of the ferris wheel worked best in my mind. Whenever I have a hotel room especially in a big city I race up to my room to see what my view is. I am like a kid that way I guess. If the view is good then I can make some photos without ever leaving the room. If I set a camera up in the window on a timer I can make photos while I am not in the room. This was a cool view until the fireworks went off at night. A nearby building completely blocked us off from them. A few years ago this would have been the perfect view.